To be true, there could be no one size fit all, so no one answer as well. It may vary with the needs of the buyer. Often small food serving joints think that they can work conveniently with home microwaves. The thought is OK when the customer traffic is smaller. However, as the size of the visitor crowd grows, demands stretch. Only commercial microwaves would be able to cope up with such a challenge. One of the biggest differences is of the number of guests received and served at a place. This reason alone weighs so much that purchase of a commercial microwave is unavoidable. After all it would be used frequently by almost everyone in the kitchen for tasks like reheating, defrosting, and preparing popcorns. And then there are oven specific tasks like baking, only in this case it is convection oven. Therefore, commercial microwave ovens are an intelligent choice for a professional set up and service delivery. 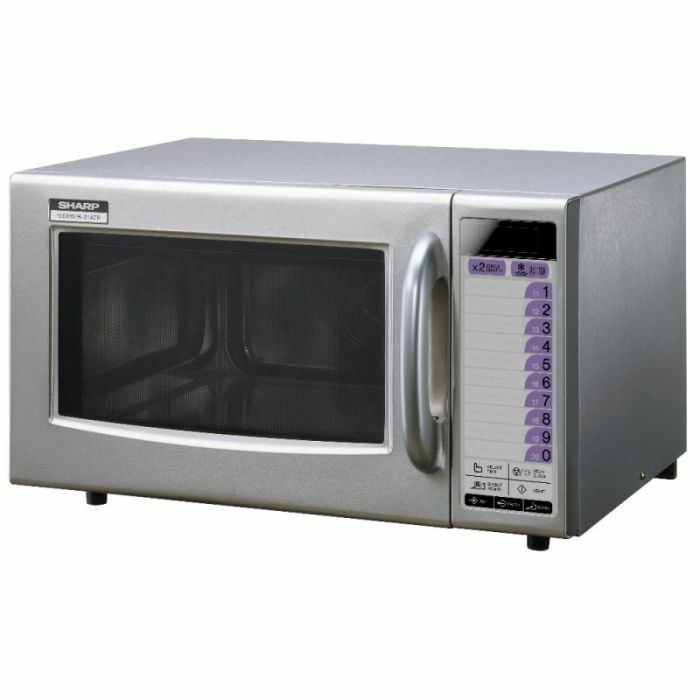 Among the most used commercial microwaves, this one from Sharp is used and reviewed quite many times, based on the satisfaction of the users. Its 11 variable cooking controls give confidence even to the most untrained person. Stainless steel cabinet makes it durable which facilitates double quantity facility. Physically, it is made more convenient by adding an easy grip handle. 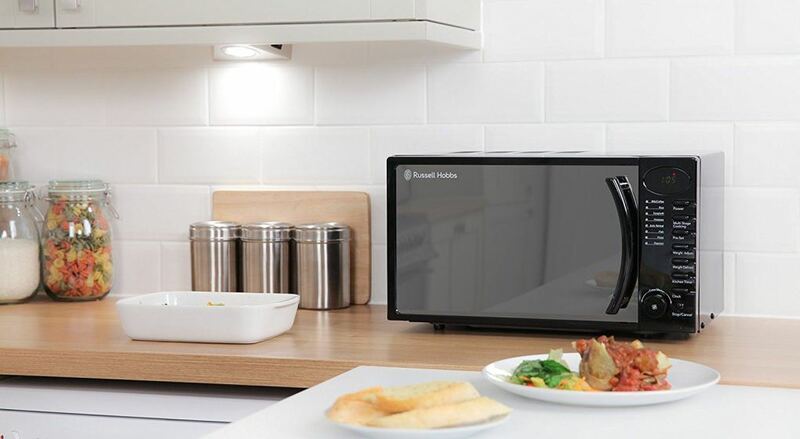 It has 20 memory settings to make life in the kitchen easier. What are the most common features looked for in an oven: quality that fits in a budget without over consuming power later! This model from the celebrated brand Maestro wave matches all these criteria and more. Almost all the professional caterers have used it once and would not mind owning one more. MW10 is a star performer, meant to be used in small and medium sized like in a rest-o-bar setting. Today these machines are popular even with the offices in addition to small businesses like cafe and coffee shops. People in these settings who have experienced this machine know that they can trust it for their reheating and cooking needs. They love it for it being easy to clean as well! Quality components, the stainless steel internal body, a 21-litre capacity are the aspects needed at busy places and it delivers. Three stage cooking saves time through defrosting, cooking and then keeping warm at the same time, ready to be served. The touch button controls make are simple to work on, not requiring any sort of training. Its compact build also allows saving on space which is always scarce in a busy kitchen. With20 presets and 10 power level, it is a handy machine to keep around, even if the budget is a bit tight. 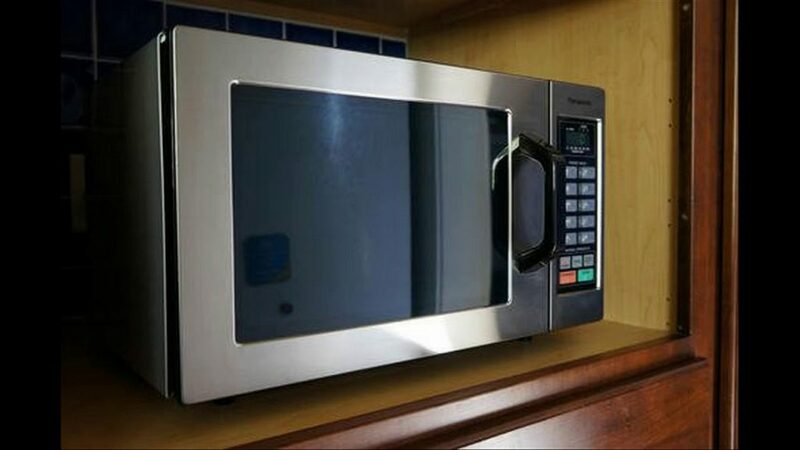 Buying this commercial microwave will give you all the most sought-after attributes at an affordable price. An experienced cook can efficiently use its touch screen for quick preparation and cooking. Offering 6 stage cooking options and power levels, the machine could work on variety of needs. Even a novice can work around this machine with its 20 programmable menus, and feel somewhat confident at working at the restaurant. Sturdy machine works on 1000 watt power output with 0.8 cubic feet of space inside. 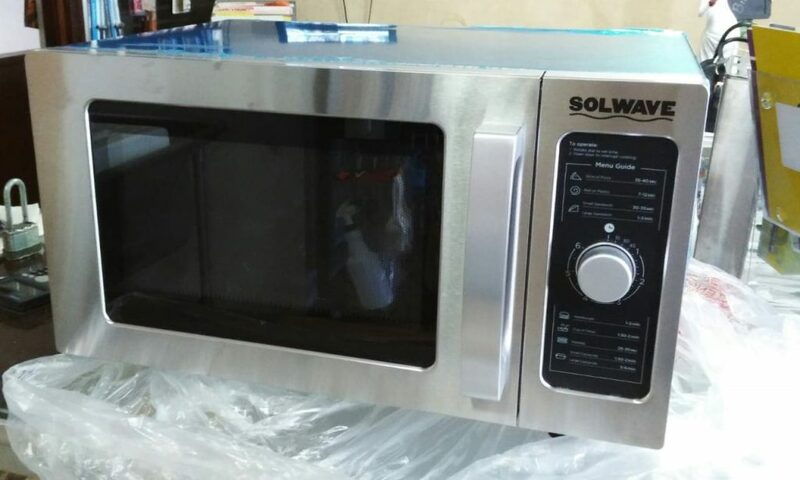 This commercial microwave oven doesn’t have a turntable, so some buyers might get doubtful but since that problem is solved by providing heat from bottom, it’s nothing to worry about. What more, it’s also faster. The ease of cleaning also draws buyer to it. Those worrying about ecology can also consider buying it without any second thought. 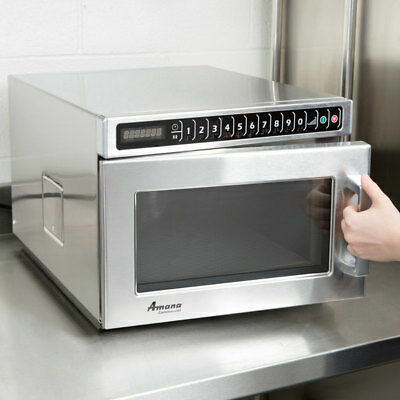 If heavy usage of a microwave is on mind, this Amana HDC12A2 is the go-to oven. Having stainless steel body (like the ones explained above), works in favour of those looking for a heavy duty machine. Push button controls are good even for very busy sessions and seasons. Cooks can pre-program up to 100 dishes; and that’s huge even by good standards. The wastage of time gets minimised while ensuring that all the tasks in your kitchen delivers without creating any fuss. For a large scale kitchen, the Amana HDC12A2 can be the partner restaurant owners look for while ensuring only the best of the catering equipment gets installed. Its see-through door makes it easy for the cooks to see if the item inside is getting cooked as expected or if it’s about to spill (sure the lighted interior supports the cause!). Up to 100 programmable settings and four- stage cooking option makes it a great choice in a busy kitchen where doing everything manually is just not efficient. 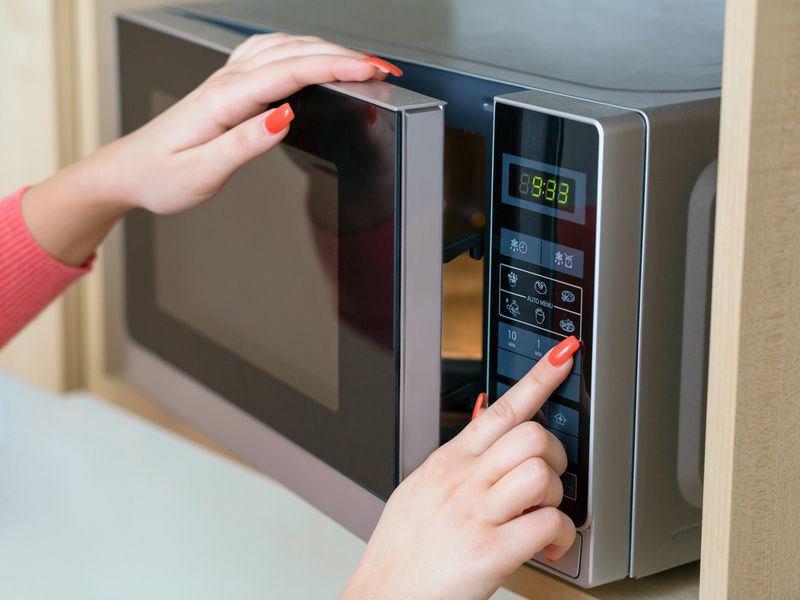 Being simple has its own benefit, and that is true even for deciding on the commercial microwave for purchase. Simplicity is best inculcated by Solwave MW1000D. And guess what simple also gets translated into affordability. If quick heating up of food is your top most priority, save some bucks by zeroing down your choice to this sturdy oven. It comes with a 6 minute dial timer along with simple push button controls. Every time you are in a hurry to heat (to serve an order), such an interface is like a life-saver. Also, 1000 watts of power can heat up just about anything, be it for sandwiches or for rolls (exceptions not yet noticed). As far as cooking is considered, 4 power settings of this oven should take care of light duty cooking needs. The above list is not in order of their supremacy. Any of these could be purchased depending on individual kitchen needs as already mentioned. So which one of the commercial microwaves caught your attention?